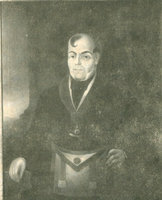 RANDAL, ROBERT (before about 1809 he signed Randall), businessman and politician; b. c. 1766 probably in Harford County, Md; probably unmarried, he had a daughter by Deborah Pettit; d. 2 May 1834 at Gravelly Bay, Niagara District, Upper Canada. Some secondary sources make Robert Randal a Virginian, but the earliest and best evidence traces him to Harford County in northeastern Maryland. Little is known of him before 1795, when he achieved notoriety as the first person cited for contempt for trying to bribe members of the United States Congress. In September 1795, Randal and two Vermonters had joined seven Detroit merchants, including John Askin* and William Robertson*, in a partnership to buy the lower Michigan peninsula, now to be open for American settlers, from the United States government. The associates planned to sell their scheme not only by bribing federal legislators with shares in the land but also by urging that, because Major-General Anthony Wayne had not effectually cowed the Indians in the battle of Fallen Timbers, the influence of the Detroit merchants with them was needed to persuade them to surrender their territory. Randal and his American associates set about lobbying congressmen, Randal indiscreetly enough to be cited for contempt. Apart from the attempted bribery, several legislators took offence at Randal’s private claims that 30 or 40 congressmen had already joined in and only a few more were needed. Randal claimed in his defence that he had not thought his proposals improper since the scheme would benefit the public, and complaisant legislators were not to receive any special consideration but merely to take part in the purchase on the same terms as the partners. His punishment was confined to a reprimand and a few days in custody. When he visited Upper Canada in 1795, Randal had had other business dealings. 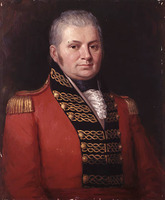 Lieutenant Governor John Graves Simcoe* had recently granted John McGill and Benjamin Canby a 999-year lease of a prime four-acre mill seat on the Niagara River, where they had built a grist-mill and a sawmill. In October, Randal concluded a provisional agreement with Canby to buy a one-third share in this concern. The agreement lapsed, but Randal’s interest in the site did not. In November 1798 he reappeared in Upper Canada and petitioned for a 999-year lease of a riparian tract, immediately north of the McGill–Canby grant, on which to erect an iron foundry. He also asked for an adequate wood-lot, the right to mine ore near by, and a 12-year monopoly of iron manufacture to compensate him for his investment. At the time of the bribery scandal in 1795, Randal was said to have recently been “insolvent.” Now, however, he produced letters of credit to the amount of £1,950 (Halifax currency) and assured the Executive Council that “General Christie” (perhaps General Gabriel Christie* of Montreal) would extend him credit to any amount. 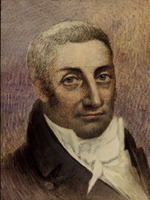 He presented letters of introduction including one from Robert Hamilton*, the preeminent Niagara merchant, which stated that Randal possessed “very respectable recommendations” from some of Hamilton’s friends in New York. The council turned down Randal’s first petition, but when he persisted they authorized him to proceed on the understanding that he would receive the desired lease once he had fulfilled his undertaking to make iron on the site. Randal then contracted to buy the adjoining mills from McGill and Canby’s successors in the lease, Elijah Phelps and David Ramsay, as well as 1,200 acres in Wainfleet Township which they owned in fee simple. By these transactions, Randal constructed the cross on which he was to suffer for the rest of his life and inaugurated a train of events that was to make him, in the eyes of many Upper Canadians, the colony’s foremost martyr to puissant greed. Randal erected his forge and began making iron, but he soon ran into financial difficulties. In June 1800 he signed two-thirds of the business over to his Montreal suppliers, Nathaniel Burton and James Maitland McCulloch, in liquidation of a debt of £1,600. In 1802 Burton and McCulloch commissioned Randal to buy and grind enough wheat to ship 6,000 barrels of flour to England, flour which Randal later claimed was the first ever manufactured in Upper Canada for the European market. The speculation was either the ruin of their fortunes or a vain effort to recoup them; either way, by June 1802 Burton and McCulloch were bankrupt. They disposed of their interest in the Bridgewater Works (as Randal had named it) to their British creditors, Caldcleugh, Boyd, and Reid, who sent out James Durand as their agent to assume control of the property. A subsequent series of transactions in October 1802 left Randal as a one-third partner in the concern, with Durand holding the other two-thirds as agent for Caldcleugh, Boyd, and Reid. For some months Randal continued to manage the property, but in August 1803 he went east, leaving it in the hands of Durand and their clerk, Samuel Street*. He bought land on the American side of the St Lawrence River, opposite Cornwall, erecting a tannery and potash works and setting up a ferry. In the summer of 1804 he established a mercantile concern at Cornwall. By his own later account, he undertook all these enterprises virtually on a whim, because he had some spare cash and nothing to do. From the start, Randal encountered difficulty in receiving the payments due to him from Durand, who bought out his principals in 1804 and took Street into partnership. In 1806 Randal suffered a serious blow when Phelps, who had never surrendered the legal title, resumed possession of the property by ejectment, of which Durand kept Randal in ignorance. Phelps then let the property to Street. It is unclear whether Street and Durand were still partners, or whether any of these transactions constituted a collusive endeavour to dispossess Randal; but it was Durand from whom Street and his new partner, Thomas Clark, were later to claim title by an instrument of 1810. Far off in Cornwall, Randal was unable to protect his interests. By 1806 he was in debt to the amount of £3,000. He spent the second half of 1807 determinedly dodging the writs of his creditors (mostly Montreal merchants) while nagging them to grant him an amnesty that would let him proceed about his business without fear of arrest. Despite the initial obduracy of the merchant Samuel David (whom Randal accused of “a Jewish persecution,” citing Shylock’s persistent demand for his pound of flesh), the amnesty was obtained in April 1808. Randal’s scheme to recoup his fortunes entailed building an ironworks on a superb site he hoped to acquire by grant from the crown at the Chaudière Falls on the Ottawa River. These works were to be supplied from “an inexhaustible iron bank, a mountain of the richest & best quality rock ore,” which he had acquired by grant across the river in Hull Township, Lower Canada (for which purpose he claimed to have left the Niagara area in 1803). His hopes were dashed in March 1809 when, just after he had finally acquired the Chaudière property, he was arrested for debt in Montreal. For the next six and a half years he languished in prison at the mercy of whichever of his creditors was to blame. He and his friends always claimed that his oppressor was Thomas Clark. After Clark and Street had forced Durand to sell them the major interest in the Bridgewater property in 1810, Clark visited Randal in prison in 1812 to press him to dispose of his share. While in Montreal, he sued Randal for a debt owed to the concern. Randal always claimed that this was an accounting transaction, but as an incarcerated debtor he was unable to defend himself. A note in his papers records one man’s testimony that he had heard Clark and two others exulting at having Randal in their power; and it is additional, circumstantial evidence of Clark’s responsibility that Randal was released only in October 1815, just after Clark had procured the Executive Council’s fulfilment of an order of the imperial government to grant him the freehold of the Bridgewater site, which until then had been alienated only by lease. Upon his release, Randal returned to the Niagara area, bent on resuming the Bridgewater property and asserting his right to the expected government compensation for damages in the recent war with the United States. His legal counsel was Attorney General D’Arcy Boulton, whom he had employed when at Cornwall. Randal’s first step was to institute an action for damages against Phelps for failing to transfer the legal title to his half of the property as provided by their contract of 1799. Randal could already produce evidence of legal title to Ramsay’s half, and he apparently hoped that a successful action against Phelps, affirming his title in equity to the other half, would sustain a petition to the government to void as improvident the freehold grant to Clark, on the grounds that Clark had procured it by falsely representing himself to be the lawful tenant under the lease of 1794. At the Niagara District Assizes of 1816, Randal won his case and nominal damages, the actual amount to be determined later by arbitration; but his opponents refused to agree to an impartial arbitrator and the matter came to trial again the following year. This time Phelps produced new evidence. In pressing their claim to the Bridgewater freehold, Clark and Street had asserted that the original deed of lease to McGill and Canby had been burnt during a fire in 1806. Now it was brought forward, endorsed with an instrument dated June 1801 by which Phelps and Ramsay had purportedly transferred the lease to Burton and McCulloch. Phelps claimed he had done this at Randal’s behest in fulfilment of their contract of 1799, and he supported his claim by the testimony of two local notables, Robert Nichol and William Dickson*, that Randal had been present and consenting at the time of the transfer. If valid, this instrument constituted grounds for the argument that Randal had renounced all title to the premises in 1801, and the one-third share he claimed under his agreement with Durand in October 1802 was a new interest which he had later forfeited by failing to fulfil the agreement. Phelps’s claim was absurd on the face of it, however, since Randal (who always denied the validity of the instrument) could have transferred the lease by his own hand had he wished. Randal was also able to produce verbal testimony of McCulloch’s denial that he and Burton had ever possessed title to the property. The jury awarded Randal £10,000 in damages, but the Court of King’s Bench ordered a new trial on the grounds that the award was excessive. 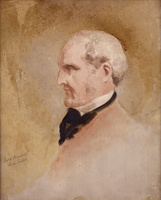 Before the assizes in 1818 D’Arcy Boulton was elevated to the King’s Bench and his son, acting solicitor general Henry John Boulton*, took over Randal’s cause. By now the Boultons had a substantial unpaid bill against their client, who was penniless until he could successfully assert his claim to the property in dispute. The younger Boulton refused to act unless Randal gave him a note of hand for £25 and security for a further £100. After Randal had given him the note and a mortgage on a lot he owned, Boulton went into court; but the presiding judge was his father, who refused to hear the case on the grounds that he had formerly acted in it. The action was held over for another year. Randal and his friends always claimed that H. J. Boulton must have known, or at least guessed, that his father would refuse to hear the case, though the solicitor general denied it. Before the assizes of 1819, Randal’s debt to Boulton fell due. He could not pay it, and Boulton instituted proceedings against him in the Home District. Randal heard nothing further after the initial notice and assumed, he later claimed, that Boulton had not proceeded to trial. In fact, he had done so and obtained judgement without Randal’s knowledge. In doing so he broke at least three rules of the Court of King’s Bench and unfairly exploited another rule, possibly promulgated ultra vires, which allowed a creditor to proceed to judgement without notifying the debtor when the latter lived outside the district in which the action was brought. To satisfy this judgement, Boulton attached the whole of Randal’s 1,000-acre property at the Chaudière Falls. In 1820 it was sold for £449: far more than the amount of Randal’s debt, but only a tiny fraction of its actual value, which was becoming known as a result of the area’s recent opening to settlement. The purchasers were John Le Breton*, a half-pay army officer who had tried in 1819 to buy a piece of it from Randal, and Levius Peters Sherwood*, a Brockville notable who became in 1825 a judge of the King’s Bench. When Randal learned of the sale, in January 1821, he instituted an appeal in Boulton v. Randal. The case was of such a nature that Alexander Stewart, Randal’s attorney and a self-proclaimed “old Tory,” later said of it that “a more rascally proceeding never disgraced the administration of justice in any country”; nevertheless, Randal’s appeal was in vain. It is noteworthy that, while Randal may not have heard of the sale before 1821, he had heard of the judgement (though he later denied it) by December 1819. Perhaps, not imagining it would cause him such loss, he had preferred at the time to let the matter go by default. It is more likely, however, that he had simply become disenchanted with the legal process; for in December 1819 the breach with Boulton had just brought about the ruin of all his hopes. In August of that year Randal v. Phelps had come on at the Niagara District Assizes for the fourth year in a row. The plaintiff, bereft of counsel, was forced to conduct his own case; Attorney General John Beverley Robinson* represented the defendant. The result of so unequal a contest was a foregone conclusion: the same evidence that had failed Phelps in 1817 now sufficed to secure a verdict in his favour. By Randal’s own account, however, this result was achieved only with the help of an extraordinary act of oppression by the presiding judge, Chief Justice William Dummer Powell. In a letter written soon afterwards, Randal asserted that Powell had threatened the jury with a writ of attaint if they found for the plaintiff (i.e., against the evidence as Powell interpreted it). This procedure had fallen into desuetude in England by the end of the 17th century. At the same assizes, Randal was successfully sued by Clark on the judgement he had won in Montreal in 1812. This decision was to lead to a sheriff’s sale of Randal’s 1,200-acre estate in Wainfleet, which Clark himself bought for the derisory price of £40. Until now, Randal had evinced little interest in Upper Canadian politics, and such evidence as exists suggests that his predilections in American politics were conservative. Now it appeared that his experiences had radicalized him. A letter to an unidentified friend reveals, though incoherently, his disaffection. “Every coercive measure has been taken and admited on the part of Powell and Cambell [William Campbell] to restrain my legal and equitable rights, to arme Clark, in withholding from me, my property. These are dispotic days; a sort of Mock Military, or tantalized Civil Government, a good deal like the Executive Religion in this Province. . . . I have now been a Victim to its influence for Ten Years.” He accused the judges of intending to restrict his movements by exposing him to arrest for debt, and blamed the Executive Council for making an improvident grant of the Bridgewater freehold when Clark had clearly deluded the imperial government into believing that he and Street were the rightful tenants. He swore he would take revenge on the judges and Robinson by pursuing their impeachment in the provincial legislature, on Durand by suing him for breach of contract, and on Durand, Phelps, Clark, Street, Dickson, and Nichol by presenting them for perjury at the next Niagara Assizes. Randal did none of these things. Instead, in July 1820, he stood in the riding of 4th Lincoln for the House of Assembly. In his election address he appealed to the popular dislike of aristocracy, favouritism, and patronage, assailed abuses in the administration of justice, and asserted the importance of electing men who would not become “puppets to executive influence.” (This last declaration was a thrust against his opponent Isaac Swayze, mha for Lincoln in the last legislature, who had instituted the proceedings leading to Robert Gourlay*’s expulsion under the Sedition Act the previous year.) Observing that “it is private injuries that produce public grievances,” he called for “an equal distribution of Justice” and “a liberal dispensation of rights.” Upper Canada’s constitution was mild and its laws just, but both were perverted by a “Maniac interest; that knows no bounds but the crush of its own weight.” Randal, by now a popular hero, won easily. He was to remain mha for Lincoln until his death. In a series of initiatives taken during 1824, Randal continued his personal quest for justice against Clark, Street, and Boulton with the help of the brilliant young advocate, John Rolph*. An action for ejectment against Clark and Street failed because Randal could show a legal title to only the Ramsay half of the property. A second attempt to reopen Boulton v. Randal foundered because it had already been appealed in vain; a final attempt to do so never came to a decision, because both D’Arcy Boulton and his successor on the bench, Sherwood, were interested parties. Randal also sought satisfaction by petitions to both the executive and the legislature. The governor-in-chief, Lord Dalhousie [Ramsay*], was sympathetic to his case concerning the Chaudière property, because the Lower Canadian government had been anxious to buy part of it at the very moment of the shrieval sale and he believed that Captain Le Breton had bid for it in that knowledge. Petitioning in 1822, when the proposed union of Upper and Lower Canada was a leading political question, Randal noted that the property (which lies immediately west of today’s downtown Ottawa) was the most central site for the capital of the united province. In 1828, when the founding of Bytown at last nerved Sherwood to test his title by an action of ejectment against Randal’s tenants, Dalhousie ordered Robinson to defend the case, but he found an excuse to refuse. With Chief Justice Campbell absent in England, John Walpole Willis* just dismissed from the bench, and judge Sherwood an interested party, the case was heard by the then puisne justice Christopher Alexander Hagerman*, who found for Sherwood at the assizes in August and then, a few months later, dismissed the appeal against his own errors in the Court of King’s Bench. Randal’s petitions to the lieutenant governor in council and the imperial government, seeking avoidance of the Chaudière sale and annulment of the Bridgewater freehold as an improvident grant, also failed. Those to the assembly evoked a swingeing denunciation of H. J. Boulton’s conduct but no practical benefit. Since Randal’s quest for justice was hampered by the colony’s lack of an equity tribunal, the assembly passed bills in 1828 and 1830 erecting a court of chancery for the special purpose of inquiring into his wrongs, but both bills failed in the Legislative Council. Nevertheless, Randal’s persistence made him a popular hero and led his enemies in the Niagara area to make another, and this time ill-judged, effort to crush him in the courts. In swearing to his qualification for parliamentary office at the general election of 1824, he claimed ownership of all the properties of which they had despoiled him. His defiance provoked Samuel Street and William Johnson Kerr* to present him for perjury at the Niagara Assizes of 1825. The trial was notable for Rolph’s brilliant defence of Randal. After discrediting the prosecution by forcing Clark to confess to his attempts to coerce Randal in prison in Montreal in 1812 (a confession which threw doubt on Clark’s claim to have been the lawful tenant of the Bridgewater property from 1810 on), Rolph closed with a speech which implicated the entire judicial establishment in Randal’s persecution and secured his client’s acquittal despite Chief Justice Campbell’s hostile summing-up. Two years later, Randal enjoyed a more devastating triumph over his enemies. 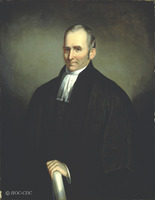 In 1827 the provincial legislature passed an act to confer political and civil rights on all those residents of Upper Canada (the majority of those of North American origin and some foreign military settlers) who had been adjudged aliens by virtue of the English court case Thomas v. Acklam (1824). The terms of this legislation had been dictated by the Colonial Office and were highly obnoxious to many whom it affected. A petition for its disallowance was got up, and the steering committee, which included Jesse Ketchum*, appointed Randal to present the request to the imperial government and parliament. He was courteously received by the colonial secretary, Lord Goderich, and the parliamentary undersecretary, Robert John Wilmot-Horton, and returned with their promise that the colonial government would be instructed to bring in acceptable legislation. If this was not passed at the next session of the provincial legislature, it would be enacted at Westminster. The success of Randal’s mission was a staggering shock to the Upper Canadian political establishment. True, the petitioners had been lucky, in that one of the objectionable clauses – that which made naturalization conditional on the beneficiary’s abjuration of his former allegiance – was now unacceptable to the British government for reasons of high policy. 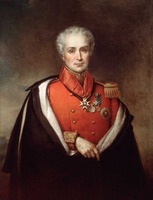 Nevertheless, the courteous treatment accorded Randal, whom they particularly despised, and his evident influence on the thinking of the imperial authorities, left Lieutenant Governor Sir Peregrine Maitland* and his advisers feeling betrayed (even though Goderich stated publicly that it was not they, but the Colonial Office, who were responsible for the legislation of 1827). Randal’s vendetta with the Niagara area élite persisted. Aided by the vagaries of imperial policy, he managed to postpone payment of most of the war losses compensation for the Bridgewater property to Clark and Street until 1833. This delay was despite the fact that, nine years earlier, Maitland had assigned the task of adjudicating the conflicting claims to their counsel, Attorney General Robinson, who had found in his clients’ favour. As the general election of 1828 approached, Randal was threatened that, if by subterfuge he had managed to retain or acquire enough real estate to qualify for re-election, it would be attached by his creditors as soon as he identified it in his qualification oath. None the less, he was returned both in 1828 and in 1830. It is unclear if these continuing feuds had any bearing on Randal’s attitude towards the question of public financial aid to the Welland Canal Company. Until 1830, he consistently opposed such aid. In that year, he voted with the minority against a bill which authorized £25,000 in aid to the canal and appointed him as commissioner to report on the state of the works to the government. He reported very favourably on the future utility of the canal as an artery in the Laurentian trade system and in 1831 supported a measure authorizing a further £50,000 in aid. The measure might be unpopular in the old Niagara River commercial centres of Niagara (Niagara-on-the-Lake), Queenston, St Davids, and Waterloo, he observed, but it would benefit many more people than it harmed. Randal’s explanation for his volte-face in 1831 was consistent with his support for the union of Upper and Lower Canada in 1822. Despite his public prominence, Randal continued all but destitute till his dying day. He had no visible means of support but his salary as mha during the short parliamentary session and, during the navigation season only, a small stipend as toll collector on the Welland Canal at Port Colborne. It is likely that his friends and fellow radical assemblymen William Lyon Mackenzie*, John Johnston Lefferty*, and Thomas Hornor helped him with money: all three are named as beneficiaries in his will, along with the impecunious Montrealers who had succoured him during his long incarceration. Jesse Ketchum, named as an executor along with Mackenzie, Lefferty, Hornor and Willis, may also have helped. An appreciation of Randal’s historical importance must start with an assessment of his personality. His role in the Michigan bribery scandal, his deportment towards his creditors in 1807–8, and his contradiction by so many leading Niagara-area personalities in the Bridgewater litigation might suggest that he was merely an unscrupulous trickster who deserved his bleak destiny; yet his career of almost unrelieved failure forbids so glib a judgement. Under closer scrutiny he appears more like a naïve optimist, even a starry-eyed visionary – a simple, amiable man, apt to be deceived by men more designing than he. Yet this is also, perhaps, too superficial a view. There was, conceivably, a self-deceiving quality to his optimism. So often was he gulled and cast down, and so tenacious was his defiance in adversity, that one suspects him of having laid himself open to such disasters by an unconscious masochistic impulse to failure. In this he resembles another opposition politician of the 1820s, Charles Fothergill*. Randal’s apparent innocence and amiability, and his defiance in adversity, all contributed to his political importance, which lay chiefly in his symbolic role as martyr par excellence to the avarice and oppression of the “family compact” and its regional affiliates. His experience seemed to typify that of the pioneer farmer, struggling to make a living in a milieu in which both the legal system and the terms of trade favoured the merchant capitalist. To these Bible-drenched pioneers, Randal’s story of spoliation by legal process was that of Naboth’s vineyard; but it was also their story, and his persistent (and ultimately political) struggle for justice set them an example. Randal also fitted the period’s conventional, “sentimentalist” stereotype of injured innocence, and he was presented in that light by advocates such as Rolph and Mackenzie: a sort of Vicar of Wakefield, a man – as he was described by his contemporaries – of “romantic history and eminent worth,” “long accustomed to persecution – the child of misfortune, and the companion of troubles,” at one time “dressed in a dark-green suit that had long since been threadbare,” at another “literally clothed with the approbation of his constituents.” Nothing did more than his sufferings to discredit the legal profession and the administration of justice: H. J. Boulton was so unpopular because of them that Maitland opposed his application to be made a judge in 1825 and Lieutenant Governor Sir John Colborne* was dubious about making him attorney general in 1829. It is paradoxical that Randal, this energetic and tenacious adventurer, should have played such an essentially passive role in public life; yet his political career was of a piece with it. Mackenzie remarked in his obituary that “few who have sat in the House have given as many good votes as Mr. R.,” but “if he ever spoke for five minutes I don’t recollect it.” Mackenzie is said to have taken up politics under Randal’s influence, and he made the cause of Randal and his heirs his own until his dying day. Randal, for his part, persuaded Mackenzie to move the Colonial Advocate to York (Toronto) in 1824 and promoted his election to the assembly in 1828. Randal probably owed his selection as the “Aliens’” ambassador in 1827 to Mackenzie and Ketchum, since both men had played leading parts the previous year in a fund-raising campaign to help him travel to London to pursue his case against Clark and Street (he tried in 1827 but was rebuffed by the British government). Randal’s correspondence in London with the Colonial Office shows an uncharacteristic polish which may reflect the counsel of his chief adviser there, the Scottish radical, Joseph Hume. The success of his mission entitles it to be considered as the first of the three great blows the imperial authorities delivered to the Upper Canadian political establishment during the colony’s last years, the others being Mackenzie’s reception in 1832, which led to the dismissal of H. J. Boulton and Hagerman as attorney general and solicitor general respectively, and the decision in 1839 to unite Upper and Lower Canada. [The two major collections of Randal’s papers are in series A-4 of the Mackenzie–Lindsey papers at the AO (MU 1915–17) and in volumes 13–14 of the William Lyon Mackenzie papers at the PAC (MG 24, B18); individual items are also intermingled with Mackenzie’s own papers. Randal’s arraignment before the House of Representatives is documented in U. S., Congress, Debates and proc. (Washington), 1795–96: cols.166–244, and in William Cobbett, Porcupine’s works; containing various writings and selections, exhibiting a faithful picture of the United States of America . . . (12v., London, 1801), 3: 43–55. The Bridgewater scandal is discussed in PRO, CO 42/373: 26–65; 42/374: 75–82; 42/375: 144–86; 42/376: 33–35, 401–8; the Chaudière scandal in U.C., House of Assembly, Journal, 1828, app., “Report on the petition of Robert Randal, Esquire,” and in Can., Prov. of, Legislative Assembly, App. to the journals, 1852–53, app.SSSS. Randal’s report on the Welland Canal is in U.C., House of Assembly, Journal, 1831, app. : 182–95. Regarding Randal’s trial for perjury, see A faithful report of the trial and acquittal of Robert Randall, Esq., a member of the Commons House of Assembly in Upper Canada, accused of perjury, and tried at Niagara, on Wednesday the 7th of September, 1825; from stenographic notes by Francis Collins . . . (York [Toronto], 1825). His correspondence with the Colonial Office on the alien question in 1827 is printed in the Colonial Advocate, 6, 27 Sept. 1827. Major newspaper sources for his career are the Colonial Advocate, 14 March–7 April 1825, the Examiner (Toronto), 21 Aug. 1850, and Mackenzie’s Weekly Message (Toronto), 18 May 1854. PAC, RG 1, E3. John Askin papers (Quaife). U.C., House of Assembly, App. to the journal, 1836, 3, no.76. Paul Romney, “RANDAL, ROBERT,” in Dictionary of Canadian Biography, vol. 6, University of Toronto/Université Laval, 2003–, accessed April 24, 2019, http://www.biographi.ca/en/bio/randal_robert_6E.html.